An archipelago consisting of the sizable Grande Terre as well as a scattering of smaller surrounding islands, New Caledonia has many of the tourist draws characteristic of the South Pacific: long sandy beaches, swaying palm trees, azure lagoons, and coral reefs. It also supports many unique species of plants and animals, such as the tall conifers that tower above the palm trees lining the waterside. Nature lovers on holiday in New Caledonia should head to the lagoon that surrounds Grande Terre: a World Heritage Site and one of the largest lagoons in the world, it is home to countless species of marine life, including endangered dugongs and green sea turtles. The local culture blends French chic and Melanesian warmth, and it is usually a only short walk from the beach to a stylish bar, cafe, or gourmet restaurant. Loyalty Islands: This group of three main islands plus a few smaller ones tops the list of places to see in New Caledonia, with untouched white sands, steep cliffs, hidden caves, and small natural pools--plus convenient facilities and gourmet restaurants. Grand Terre: Bordered by a coral reef in one of the world's biggest lagoons, Grand Terre encompasses a vast territory of several microclimates, including a mountain range in the middle, both sides of which support a rich diversity of animal and plant life. Ile Des Pins: Covered with dark pines--from which it gets its name--this island also boasts vast sandy beaches, peaceful lagoons and pools, as well as a rich local culture and traditional cuisine. Noumea: French architecture, cuisine, and culture meet palm-lined white beaches of the South Pacific in this national capital, a must-see on your New Caledonia vacation. Mare: Considered a hidden gem, rustic Mare offers unforgettable cruise views, relaxation on warm sandy beaches, as well as cycling tours of the local culture and natural world. Yate: Offering some of the best camping and hiking trips in New Caledonia, this biodiverse area includes endemic bird species and remains a favorite with outdoor enthusiasts. Aquarium des Lagons Nouvelle Caledonie: Home to fascinating sea creatures, including the flashlight fish, giant clam, and nautilus mollusc, this aquarium ranks among the favorite places to visit in New Caledonia. 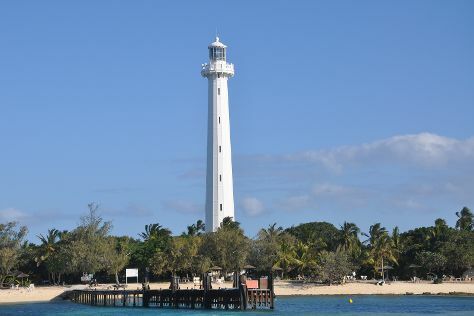 Amedee Lighthouse Island: Climb the island's French-made metal lighthouse for views of the lagoon from the top, or don snorkeling gear for some underwater exploration. Anse Vata Beach: Get active on this white sand beach with windsurfing and kitesurfing, or swimming and snorkeling in its small reef. Ile aux Canards island: Among the smallest of the islands, Ile aux Canards lets you kick back on the soft white beach, take a dip in the transparent water, and sample local specialties in a small restaurant. Piscine Naturelle: This natural pool lies bordered by coral cliffs and tall pines, perfect for relaxed swimming and snorkeling. Tjibaou Cultural Center: Designed in a combination of modern and traditional architecture, this center makes an interesting addition to any New Caledonia itinerary, offering insight into the island's indigenous Kanak culture. Plage de la Baie des Citrons: Clean, shallow water and soft sand make this beach popular for family holidays in New Caledonia, with enough space for all kinds of activities both in the water and out, plus the added security of lifeguards on duty. Place des Cocotiers: Bursting with colorful tropical plants, this park offers a quiet getaway from the crowds; meet the locals, attend entertaining events on weekends, and fill up on local street food. Lifou Island: Lifou draws visitors with hidden caves and lush greenery surrounded by steep cliffs, as well as snorkeling in the warm, turquoise waters and cruises around the islands. Kanumera Bay: Visit Kanumera Bay for its pristine stretch of sand and transparent warm water, perfect for discovering the marine world and simply relaxing. Due to the innumerable beaches with soft, white sands and abundant wildlife, New Caledonia makes an inviting family destination. The island of Noumea--the largest and most developed in the nation--offers a variety of kid-friendly activities, whether you want to discover culture and nature, or simply swim in the crystalline lagoons. The Isle of Pines boasts small natural niches perfect for carefree play, as well as secluded pools with shallow, warm waters where young ones can observe the tiny, colorful fish and corals. Visit Loyalty Islands during your New Caledonia vacation, and you'll find a variety of easy hiking trails, more beaches, and the added convenience of modern facilities and attractions that differ from the rustic atmosphere elsewhere on the islands. Apart from the endless beaches, you'll have plenty of other New Caledonia vacation ideas to explore. Tchou Tchou Train, for example, offers a two-hour guided tour through the island, complete with interesting facts about the country, culture, and history. Kids can learn about the archipelago's vast diversity of animal and plant life at the zoo and forest park, while families with older children can tackle a healthy hike up Pic N'Ga, the country's highest peak. For those who enjoy history and mystery, the 19th-century prison at Fort Teremba will stimulate kids' imagination. Most of the hotels in this friendly, welcoming country offer babysitters for several hours a day, and you can book rooms with all the facilities for babies and toddlers. Depending on your resort, you may have access to private pools and kids' clubs with a variety of games. Most restaurants and family attractions in New Caledonia offer a discount on food and admission for kids, but make sure you ask beforehand. Some of them are even free for children up to a certain age. When you first arrive, find a supermarket and shop for the basic necessities such as water bottles, wet and paper towels, snacks, painkillers, and allergy medicine, as you might have problems finding these supplies on the smaller islands or on Sundays/Mondays, when most amenities are closed. One of the first things you'll notice on your New Caledonia holiday is the attention people pay to the culture of eating. Cuisine has an integral role in local life, so much so that for some it borders on a philosophy of hedonism. Due to the position and climate of the country, dishes in New Caledonia feature lots of tropical fruits and seafood, but also chicken. One of the most famous is "bougna"--a mix of chicken, yams, coconut milk, and bananas, all together cooked in an earthen oven. You might want to think twice before tasting "civet de rousette," a delicacy consisting of stewed bat. As with the rest of the culture, you'll see plenty of French influence in New Caledonia's cuisine. Numerous restaurants serve French food and wines, and traditional French patisseries seem to occupy every corner, serving golden croissants and baguettes. Things get interesting when these different traditions cross, so consider ordering a croissant filled with seafood and a variety of fruit dips. There are many different shopping opportunities on a New Caledonia vacation, in both stores and open-air markets. National capital Noumea has it all, from French fashion boutiques to vibrant bazaars selling fresh seafood, local produce, and quality souvenirs. Look for handmade jewelry, scarves, and traditional fabrics, and pay special attention to the tribal art, which carries a piece of the indigenous culture and tradition. If in town on a Thursday, head to the market on Place des Cocotiers in the Latin Quarter. During Christmas, charming markets spring up in Noumea and other towns. Edible delights will make perfect gifts for friends back home--especially the local chocolate. Beyond that, you can shop for luxury goods in dedicated tax-free stores. * New Caledonia is among the world's top exporters of nickel, with over 10 percent of the reserves of the metal. * Over 96 percent of New Caledonia's population is literate. * Yam is considered sacred in some parts of the country. * The Kanak tribe people don't believe in private property, but rather share the land. When you meet locals on your New Caledonia holiday, keep touching to a minimum, including hugs and handshakes. Never touch anyone's hair, which locals consider sacred. Such gestures may make New Caledonians uncomfortable. Also, be careful when addressing a person, whether they're European, Melanesian, or a member of the Kanak tribe. Some may feel offended to be wrongly identified. When in doubt, you can ask. If you're visiting a local, try not to be late, stay for too long, or drink too much alcohol. You may bring a small gift, such as wine, flowers, chocolate, or something similar. If this is your first visit to the home, your host will offer some food and drink immediately upon arrival. Even if you're not hungry or thirsty, it's extremely impolite and insulting to refuse: take just a little to show respect. The majority of people in New Caledonia belong to the Roman Catholic church, and state holidays include Christmas, Easter, and other major religious dates. Towns deck themselves out in December, and many cafes and restaurants have a Christmas menu. Due to its connection to France, the country celebrates some of the French national holidays, like Bastille Day (July 14), which features fireworks, military parades, and public festivities. However, there's a variety of other festivals you might want to attend during your New Caledonia trip. One of them is Noumea Carnival, usually in mid-August, with a parade, dancing, outdoor concerts, and fireworks. Sports fans may want to check out the New Caledonia triathlon, with several hundred contestants from different countries competing for a prize. And the all-important yam gets its own celebration during harvest, especially in the Kanak tribe, in February, March, and April, with village parades and music. Today, the French language pervades in New Caledonia, even in remote villages, but schools also teach the 28 variations of the Kanak language. Do not expect to encounter very many English-speakers during your New Caledonia holiday. Instead, learn a few phrases in French to help things run smoothly: you'll need to know at least "bonjour" and "bonsoir" (hello/good evening), "s'il vous plait" (please) and "merci" (thank you), "excusez-moi" (excuse me), and "parlez-vous anglais?" (do you speak English?). It's acceptable to greet a person with a handshake, but refrain from touching or hugging them unless you're very close. Also avoid kisses and other close physical contact with people you've just met. New Caledonia enjoys a tropical climate, with little variation from island to island and two basic seasons. The hot season lasts from December to March, with the average temperature around 30/32 C (86/90 F). The cool season, which lasts from June to September, is characterized by slightly cooler temperatures of 23 C (73 F). If you're touring New Caledonia during the warm season, expect short rain showers. Rain is usual for the intermediate seasons that occur twice a year, in April and October, when the average temperature hovers around 26 C (79 F). Depending on the island you're on during your New Caledonia holiday, you'll use different modes of transportation. For example, Grand Terre offers taxis, public buses, and scooters for rent, whereas on Lifou you'll want to walk around, or, as an alternative, rent a bike. The larger islands have rental car services, and sea taxis shuttle between the islands. If you really want to enjoy yourself, opt for a cruising tour. During your New Caledonia vacation, you aren't expected to tip in restaurants or cafes. However, if you're especially satisfied with your waiter, you can round your bill up and not ask for change. Taxi drivers and tour guides also don't expect a tip, but if you're exploring on your own and happen to ask a local for help, you can offer them some money or a small gift--but only if you sense it's not inappropriate or insulting.